Dedicatory Prayer——♦—— O SWEET JESUS, my Lord, my Saviour, and my God, behold me here prostrate before thy majesty, devoting and consecrating this book to thy glory; give life to its words by thy blessing, that those souls for which I have written it, may receive from it the sacred inspirations which I desire for them. And particularly that of imploring for me thy immense mercy; to the end that, whilst showing others the way of devotion in this world, I may not myself be eternally rejected and confounded in the other; but that, with them, I may for ever sing, as a canticle of triumph, the words which, with my whole heart I pronounce, in testimony of my fidelity amidst the dangers of this mortal life: LIVE JESUS, LIVE JESUS; yea, Lord Jesus, live and reign in our hearts for ever and ever. Amen. 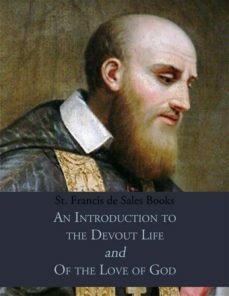 Preface OF St. Francis de Sales——♦—— Dear reader, I pray you to read this Preface for your satisfaction and for mine.——— THE bouquet-maker, Glycera, was so skilful in diversifying the arrangement and mixture of the flowers which she used, that with the same flowers she made a great variety of bouquets; so much so that the painter, Pansias, failed when he endeavoured to copy so great a diversity, for he could not change his painting so many ways as Glycera did her bouquets. Thus the Holy Ghost disposes and arranges with such variety the instructions regarding devotion which He gives by the tongues and pens of his servants, that, although the doctrine is always one and the same, the discourses which are held on it are, nevertheless, very different, according to the various methods in which they are composed. I certainly cannot, neither do I wish, nor ought I to write in this Introduction but what has been written by our predecessors on this subject. They are the same flowers which I present to you, my reader; but the bouquet which I have formed from them will be different from theirs, on account of the difference of the method of making it.